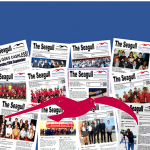 The Seagull is the Jo Richardson weekly newsletter. A selection of photos from JRCS. Welcome to our own TV channel. You'll find a selection of videos from our YouTube channel below.